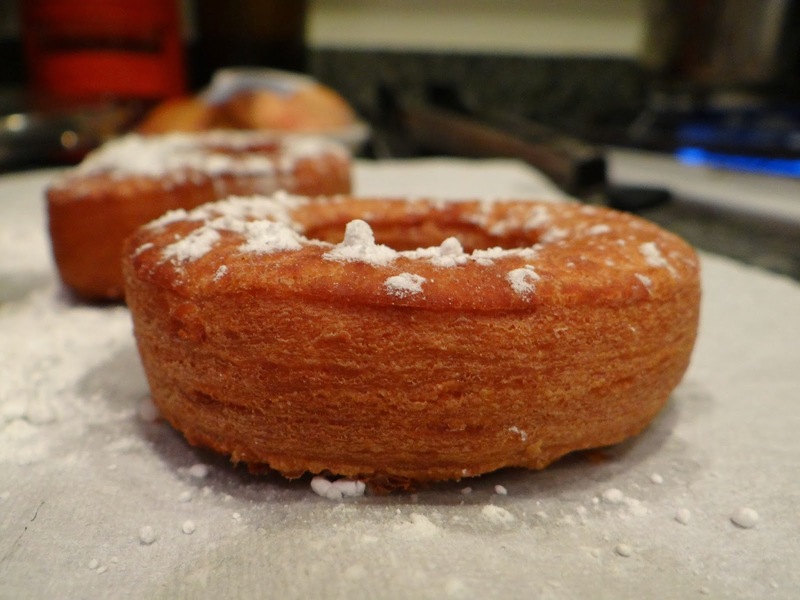 I hesitated to publish this post because those who are looking for a recipe for cronuts from start to finish are going to be disappointed. However, it may prove helpful for those looking for clarification on how to take puff pastry and use it to make a fried doughnut-shaped but croissant dough-based delicacy. First things first: what is a cronut? 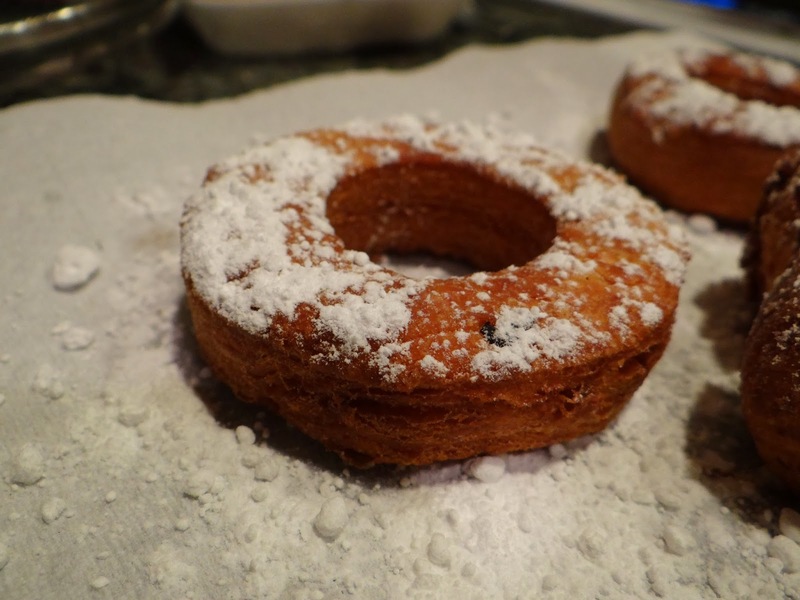 The Cronut (TM) is a trademarked name for a croissant-doughnut hybrid created by Dominique Ansel in May of this year. It immediately sparked an international craze and fans flocked to his bakery, sometimes standing in line for hours, for the chance to score one of the limited number of treats made each day. Many other bakers and bloggers have attempted to recreate the cronut. 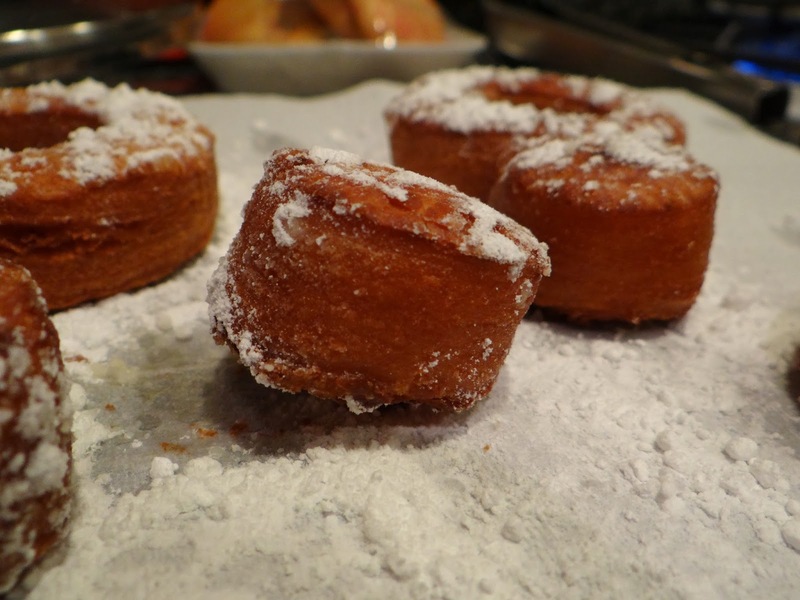 Also, Cronuts (TM) are filled with cream and topped with glaze, as you can kind-of see from the picture. However, I don’t want to give myself a heart attack and I don’t really like super sweet pastries, so I limited embellishment to a sprinkling of powdered sugar. I myself have never eaten a true cronut so I can’t say for certain that what I made tastes anything like one, but it is tasty. I ended up making these because my sister made a huge amount of puff pastry for a Thanksgiving dish she was making, and ended up with a lot leftover. 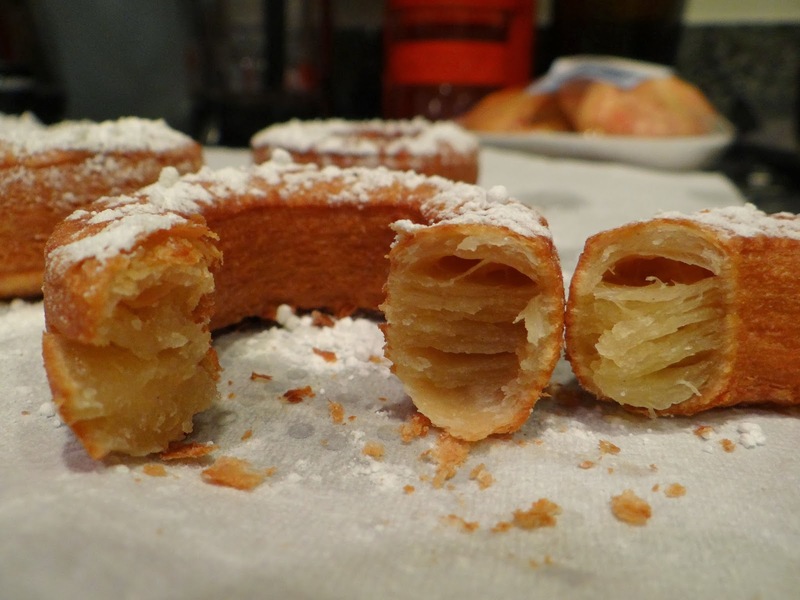 Here is how we took the puff pastry and made it into our version of cronuts. You will want to start with cold but not frozen puff pastry dough. Our dough was unleavened and made with salt, water, butter, and flour. 1. First, pour some oil into your pot so that it rises about two inches. You are going to be almost deep-frying the dough, but not quite. Let it slowly warm up to about 330-350 degrees F.
2. Now, take your puff pastry and roll it out. I think the reason my cronuts did not rise as high as Dominique Ansel’s is that I rolled the dough out too flat. Maybe next time I will leave it thick. 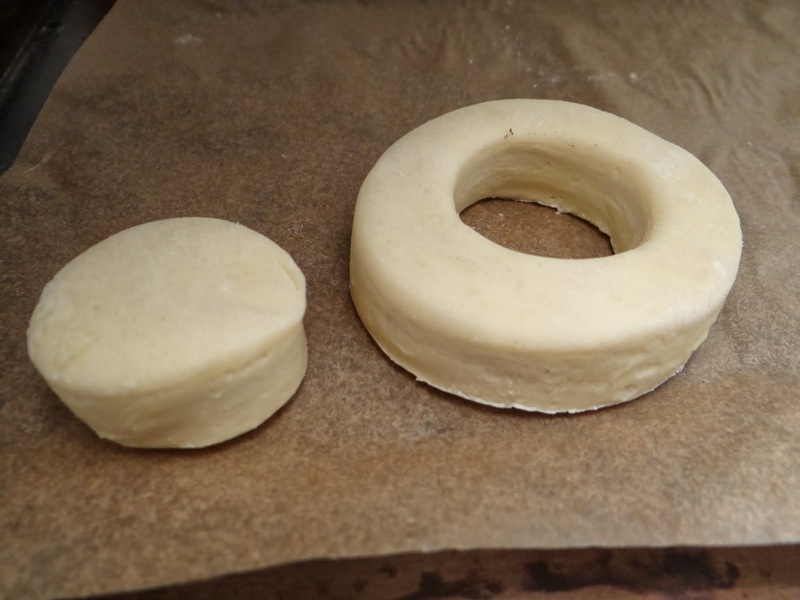 Using one large and one small round pastry cutter, cut out the dough into circles. 3. When the dough and the oil are ready, carefully place the dough into the pot. 4. The first cronut was a little wonky, but I got better about timing as it went on. Once the first side is nicely browned, flip it over. The cronuts will puff up as they cook because of the butter trapped between the layers of puff pastry. 5. 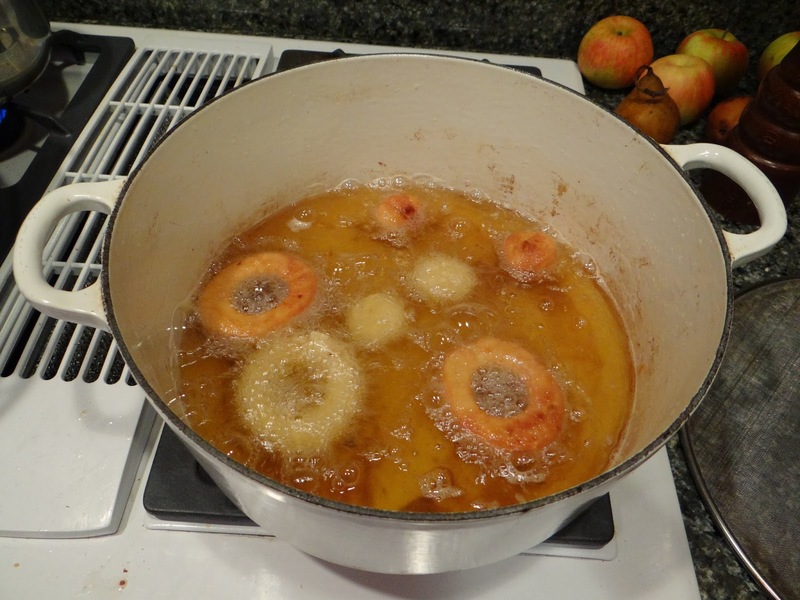 As they finish, use the handle of a wooden spoon to remove the cronuts from the pot and let them cool on a paper towel over a plate or a cooling rack. Sprinkle the hot cronuts with powdered sugar. 6. I love seeing the layers of dough! So, obviously this is not a perfect recreation of the Cronut (TM). But that didn’t stop us from eating way, way too many warm cronuts the night we made them. And Little Bread Toddler ate two this morning. The nice thing about these is that they aren’t jumbo sized, so you don’t feel your arteries clogging as you eat them (sneaky cronuts). I have to say, these are a fun, special occasion treat. I’d probably still make regular doughnuts though. Maybe I just need to try the real thing? OMG those look incredible! I MUST TRY THEM!